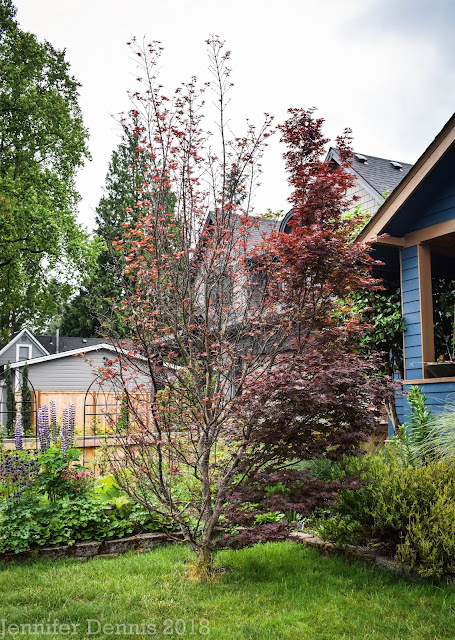 It's the 15th of the month and time to take a tour of the garden to see what is blooming in May. We've had spots of unseasonably warm temperatures this past month, which for 'cottage' style gardeners like myself...isn't the best. 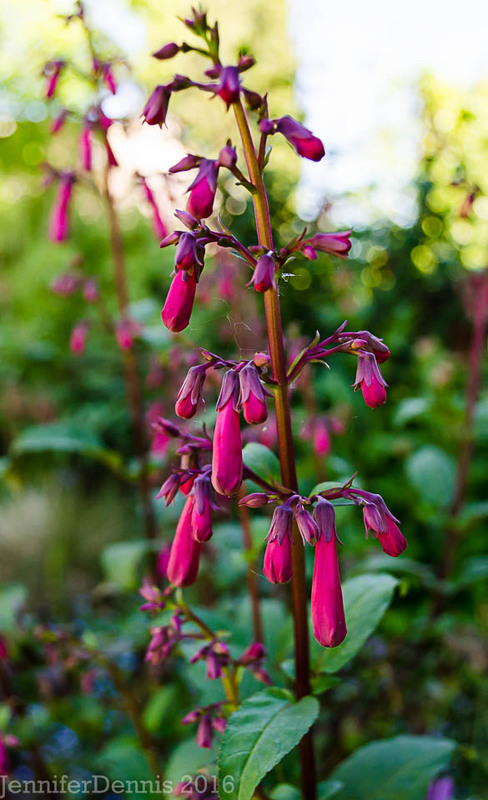 It pushes those sweet spring plants into a quick bloom and singes the tips of petals. However, I have enjoyed quite a few evenings outdoors, enjoying the warm temps with a good book in hand. Here is a view of seating area in the back garden. The snowball tree is finishing it's blooms. This is my favorite place to be after a day at work. 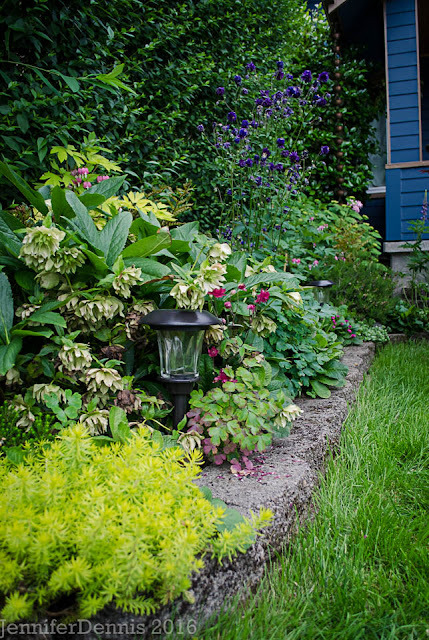 Meanwhile, in the front gardens, the side strip of early spring blooms finds the hellebores begging for a trim. My absolute favorite bloom in May, is my heirloom peony. It reminds me of the peony my Oma (Dutch grandmother) used to grow. 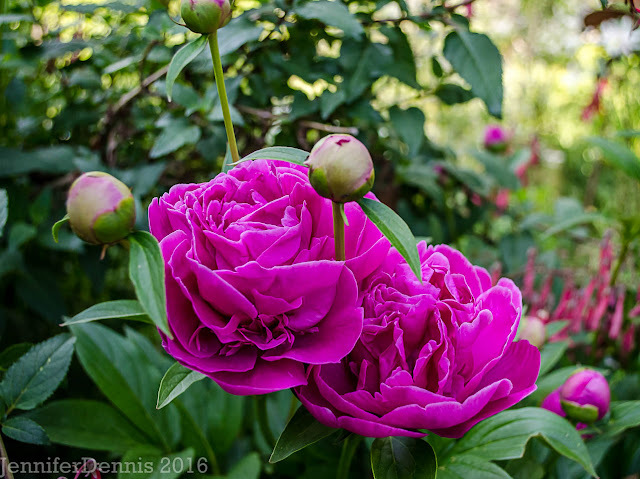 It has the sweetest scent and is so 'unfussy' for a peony. 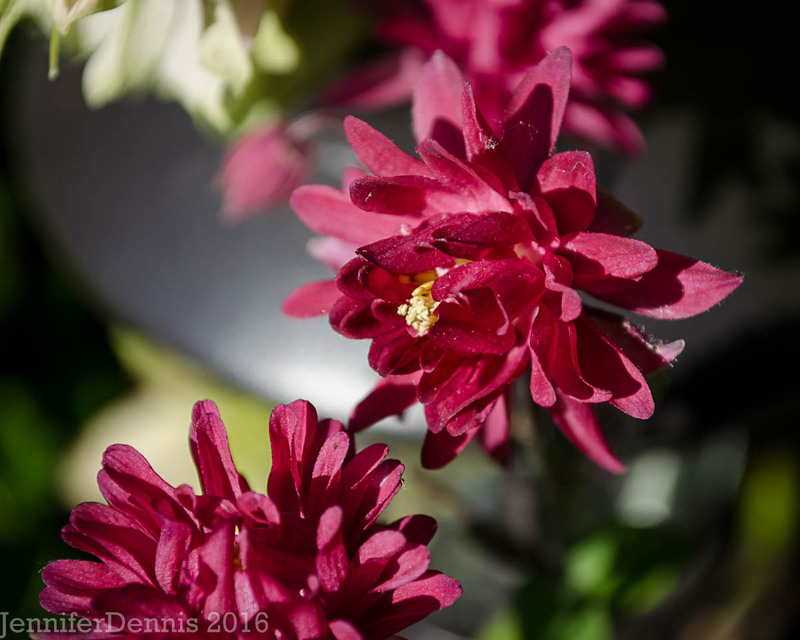 Usually I have delphinium blooming behind it..but sadly this year, the plant was attacked by slugs before I could come to the rescue. 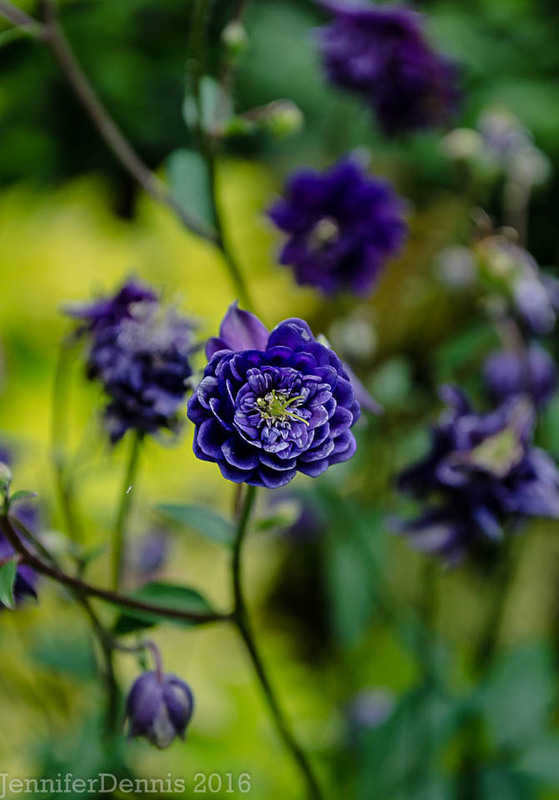 Aquilegia are the main players of the May garden. My personal favorites are the yellow ones, but I love them all. Their dainty blooms dance in the spring breezes. 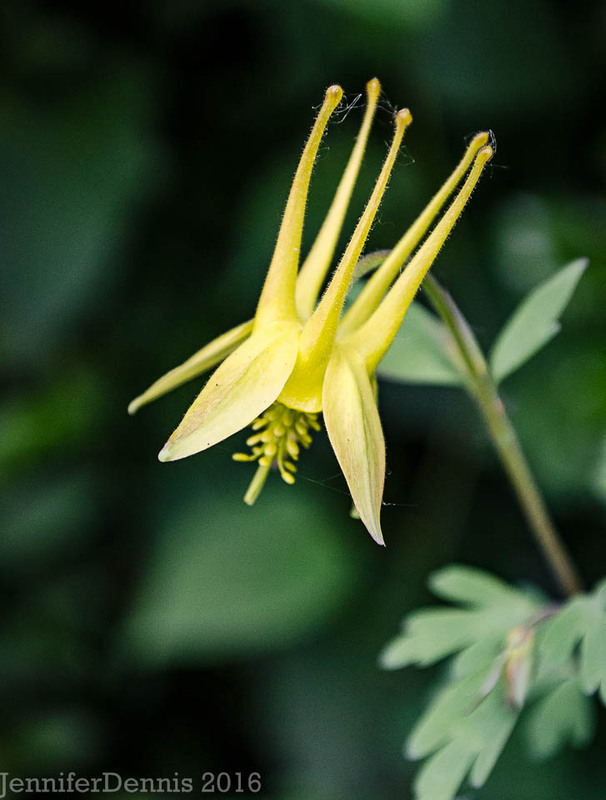 I love yellow columbines so much that I have two new plants to cram - err, find a spot for - in the gardens. 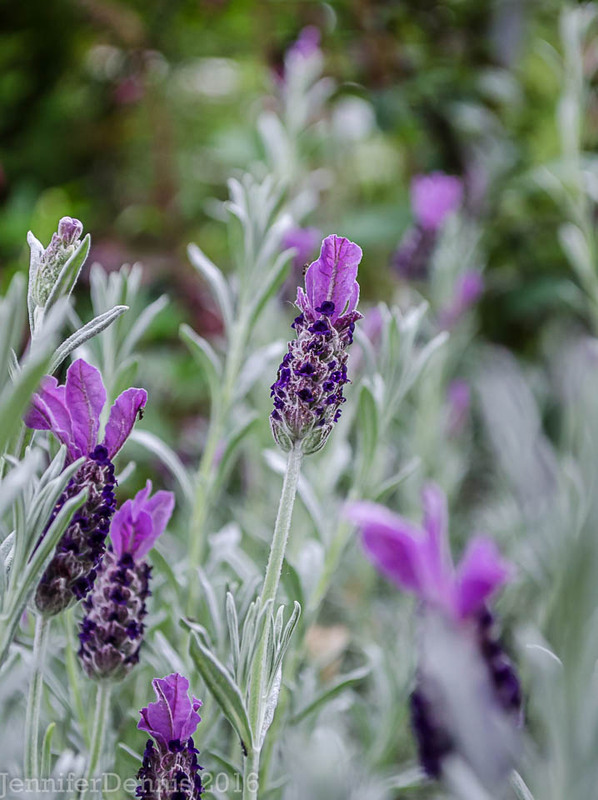 Spanish lavender is brightening up the back gardens. It does not provide scent, but it has great form and color. 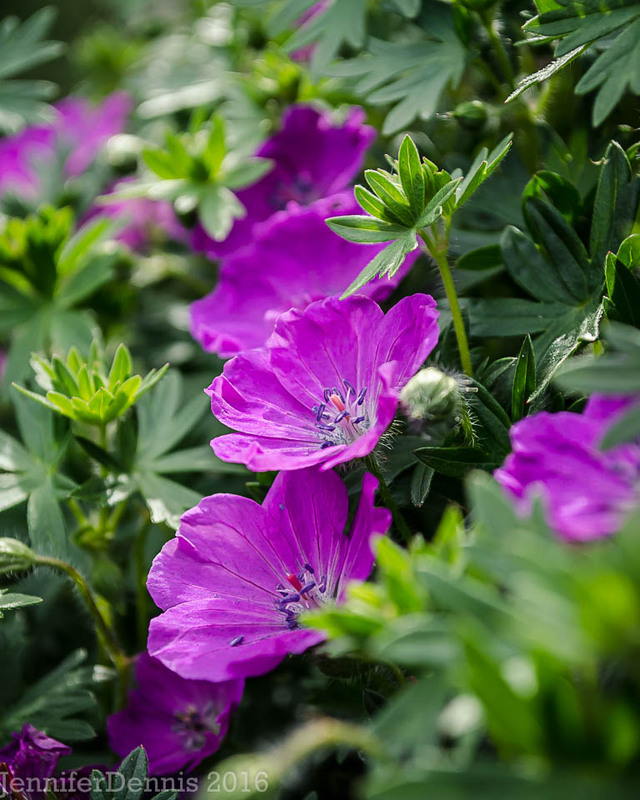 May is an interesting month in the garden as it's becoming a transition month from spring to summer blooms. Hardy fuchsia's, geraniums. lupines are staples in my cottage gardens. Hop on over to Carol's at May Dreams Garden and see what is blooming around the world. Jennifer-your gardens are so lovely and inviting. I can see how the outdoor sitting area is your favorite place after a long day's work. It looks so relaxing among the blooms...I would never want to leave it! Happy Bloom day ! I love all your Columbines . I have to admit that I've been digging them out by the dozens in my garden ! I think I need a few new ones in the mix ! A beautiful month in your garden but our heat is making spring fly by far too rapidly. "If the hands of time were hands that I could hold," I'd make this beautiful time of year last a few months longer! I sowed some yellow aquilegias last year and they are now flowering for the first time. I am very pleased with them. 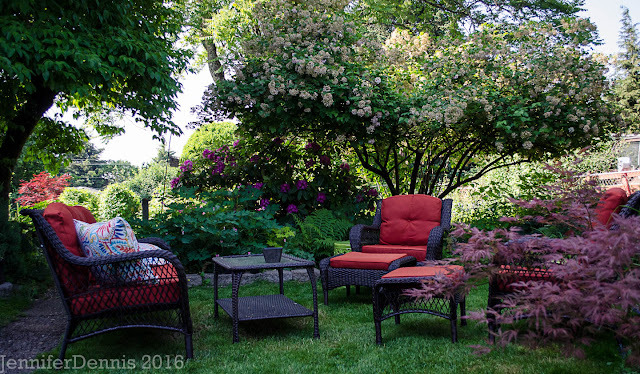 Your backyard seating area is a dream space, Jenni! I suffer from severe peony envy so of course I loved those fat pink blooms. 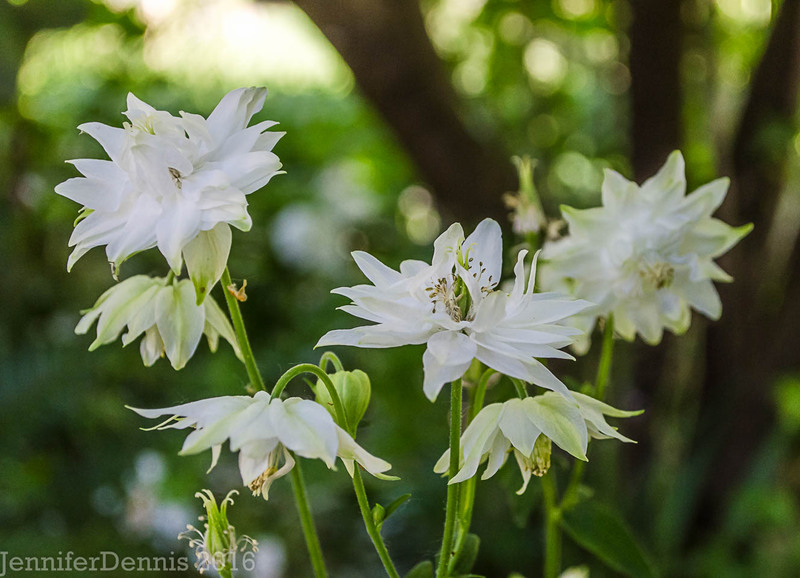 And how I wish Aquilegia were as happy here as they are in your garden- I expect rain, of which we've had little of late, is key to making them happy. You have the perfect spot to soak up spring's fleeting beauty. I remember many springs when the rain never let up to allow that kind of leisurely appreciation. I try to remember that when tempted to complain about the heat. Ya know Ricki, I remember those days too and I find it weird now...the sun and warmth in April and May.